UDM Downloads > 3D Morris! 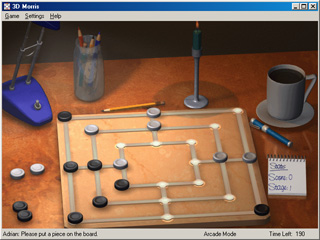 3D Morris takes a popular classic board game called Nine Men's Morris into a new dimension by offering an innovative arcade mode. It comes with various Internet gaming options and a tutorial you can use to learn the rules without reading the manual. If you are already familiar with this game, you will be amazed by the possibility to play 3D Morris against your friends or computer opponents of varying skill levels. 3D Morris also comes with 3 wonderful 64.000 color prerendered 3D environments and 8 nice sound tracks. Anyone seeking endless hours of brain teasing fun should certainly give 3D Morris a try!